Citibank Online is an internet banking service, sometimes called ebanking, that lets you perform banking transactions online. You can logon and manage your Citibank account and savings online with instant access to your money, thanks to Internet banking. Register and enjoy promotions with Citibank Online banking service. We have enhanced the layout and introduced new features such as Express Payments, Global View of Account, Citi Alerts and a Personal Budgeting Tool to make internet banking simpler for you. 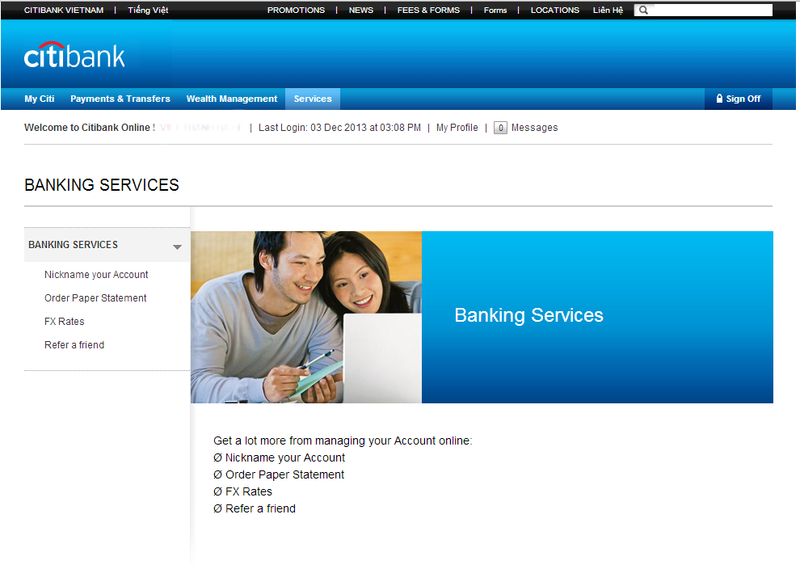 Enjoy your new experience with Citibank Online. We have enhanced the layout and introduced new features such as Express Payments, Global View of Account, Citi Alerts and a Personal Budgeting Tool to make banking simpler for you. 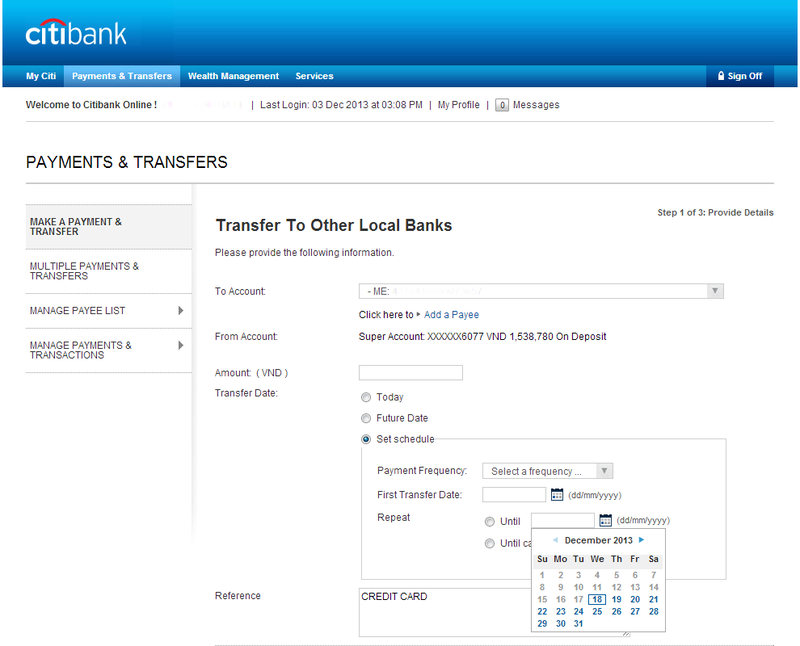 Currently, fund transfers on Citibank Online can only be made within Vietnam and in VND (except for Citibank Global Transfer service). If you choose to conduct a transfer from a Citibank foreign currency account, the fund will be converted into VND and then remitted. 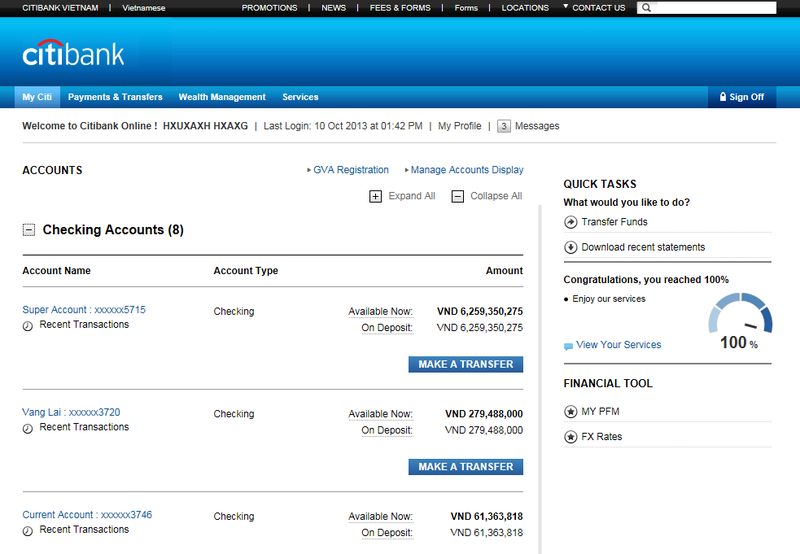 The destination account must be a VND account also. 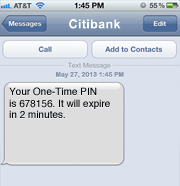 Is a randomly-generated 6-digit PIN sent via SMS to your mobile. Acts as a second-level authentication for online transactions, to confirm that the transactions are authorized by you. Need only be entered once per online session, for as many transactions as you like within that session. In order for you to receive your One-Time Password (OTP) successfully, it is important to update the bank with your latest mobile phone number. 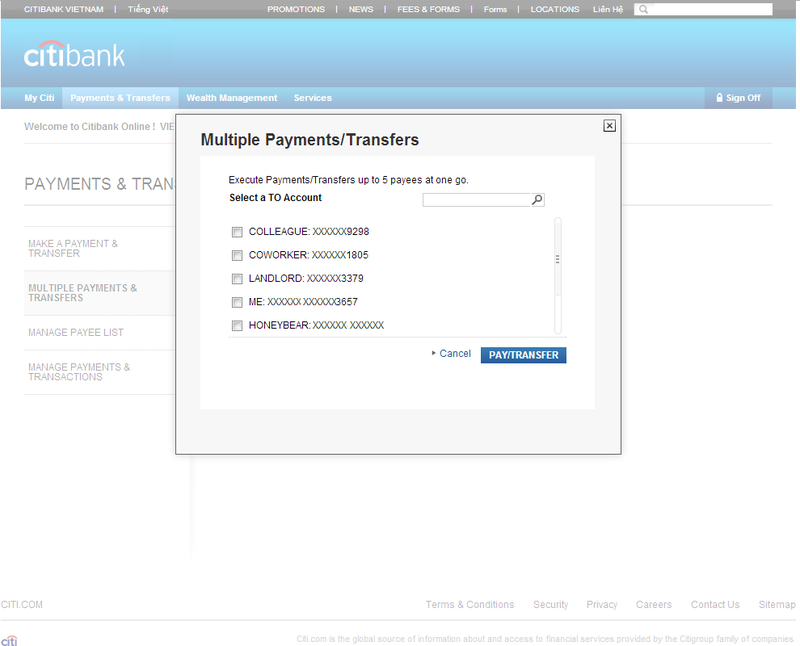 Whenever you need to perform an online transaction, you will be required to enter your One-Time PIN (OTP). The One-Time PIN (OTP) will be delivered to you via SMS. 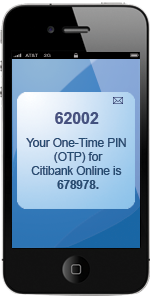 The OTP (One-Time PIN) will be sent to your mobile number at : 848905998099. You will then create your own User ID and Password. Ensure you review the password rules and tips. 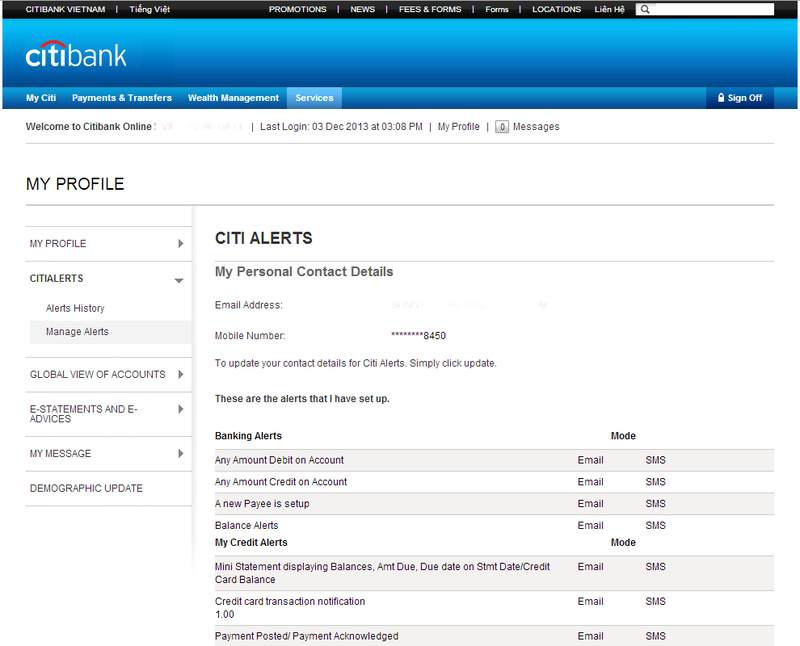 Your unique User ID and Password is used each time you sign on to Citibank. Next create your security questions for additional Online Banking security. You will be asked to answer one of three questions each time you sign on. 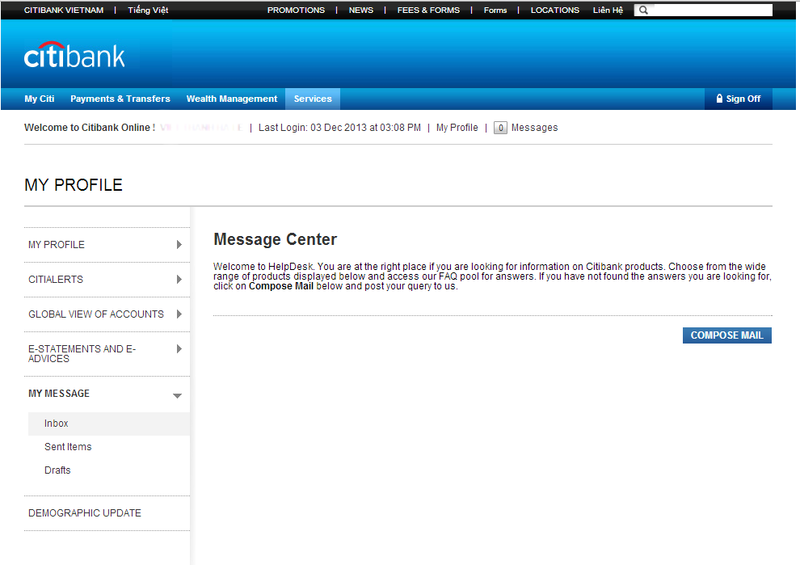 Accept the Citibank Online Terms and Conditions.